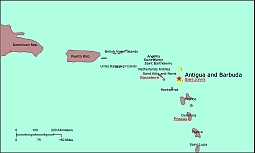 Editable royalty-free map of Antigua and Barbuda in vector-graphic online store. Leeward Islands. Its northeastern coast is lined by many islets and its central area is a fertile plain. Barbuda is a coral island that has a large natural lagoon in the north-west. Redonda is a rocky, low-lying islet. Despite Antigua being a partly volcanic island, there have been no eruptions in recent history. The highest elevations are in the southwestern part of the island. This is where Boggy Peak (1,319 ft / 402 m), the tallest mountainon the island, is located. Neither Barbuda nor Redonda have any significant elevations. Antigua and Barbuda lack any large rivers or lakes of significant size. Antigua and Barbuda are located in the eastern Caribbean Sea. The open Atlantic Ocean lies to the north and east. There are many coral reefs in the vicinity of Antigua and Barbuda. The island of Guadeloupe lies to the south, on the far side of the Guadeloupe Passage from Antigua. Antigua and Barbuda is famous for its beaches, estimated at 365, particularly those on Antigua itself. Themost noteworthy feature of Barbuda’s coastline is the natural lagoon on the western side of the island. Temperaturesaaveragea84°Fa(29°C)ainaJulyaanda75°F (24°C) in January, a result of the cooling trade winds from the east and northeast. drought and autumn hurricanes, although the low humidity makes it one of the most temperate climates in the world. The sandy soil on much of the islands has only scrub vegetation. Some parts of Antigua are more fertile–most notably the central plain–due to the volcanic ash in the soil. These areas support some tropical vegetation, and agricultural uses. The planting of acacia, mahogany, and red and white cedar on Antigua has led to as much as 11 percent of the land becoming forested, helping to conserve soil and water.